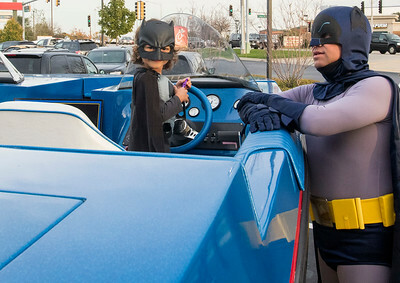 Sarah Nader - snader@shawmedia.com Dressed as Batman Glenn Chelius of Crystal Lake shows Mason Cook, 4, of Carpentersville his Batboat at Chic-Fil-A Super Hero Night in Crystal Lake Thursday, Oct. 26, 2017. Cook, a huge batman fan, had fallen Aug. 12 off a third-story balcony while visiting his father in Chicago. Chelius visited him when Cook was bed-ridden and promised to show him his Batboat. 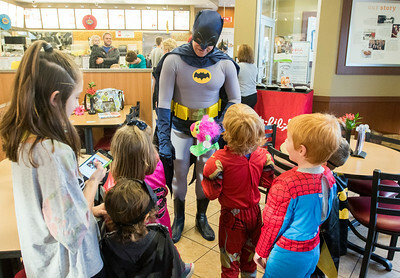 Sarah Nader - snader@shawmedia.com Dressed as Batman Glenn Chelius of Crystal Lake greets children at Chic-Fil-A Super Hero Night in Crystal Lake Thursday, Oct. 26, 2017. 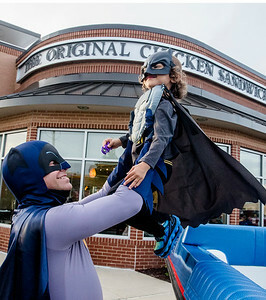 Sarah Nader - snader@shawmedia.com Dressed as Batman Glenn Chelius of Crystal Lake puts Mason Cook, 4, of Carpentersville into his Batboat at Chic-Fil-A Super Hero Night in Crystal Lake Thursday, Oct. 26, 2017. Cook, a huge batman fan, had fallen Aug. 12 off a third-story balcony while visiting his father in Chicago. Chelius visited him when Cook was bed-ridden and promised to show him his Batboat. Dressed as Batman Glenn Chelius of Crystal Lake shows Mason Cook, 4, of Carpentersville his Batboat at Chic-Fil-A Super Hero Night in Crystal Lake Thursday, Oct. 26, 2017. Cook, a huge batman fan, had fallen Aug. 12 off a third-story balcony while visiting his father in Chicago. Chelius visited him when Cook was bed-ridden and promised to show him his Batboat.